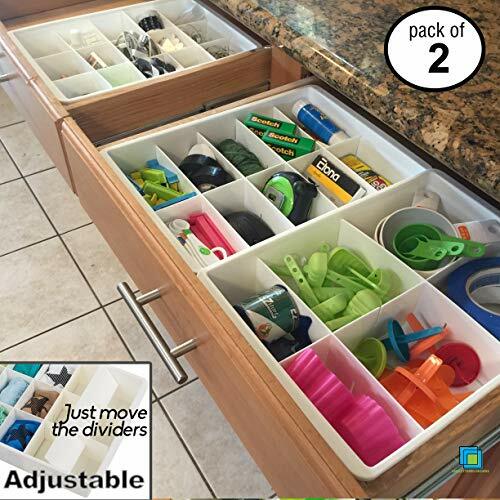 Multifunctional – Organize Every Room In Your HouseYou know that kitchen junk drawer you toss everything into? Make it a work of creatively organized art!Keep your office drawers tidy with everything in its own slot.Keep your shelves neat. Stackable boxes keep all your odds and ends perfectly tidy on your shelves.Keep your crafts tidy in drawers or stacked on shelves. Your bathroom will thank you for these washable and waterproof organizers.Keep everything tidy under the sink.Got kids? Small toys, accessories and baby clothes will find a home.Great for essential oils and other small items. How to customize your set Each sturdy set comes with 2 boxes of 13.5 x 9.75 x 3.25 – with 4 lengthwise and 8 crosswise dividers to insert into the side slots.You can make 15 cells by inserting 2 long dividers and 4 short dividers.You can make 10 cells by inserting 1 long divider into the middle slot and 4 short dividers.Be creative! If you have some long items, some medium, some small – just leave out some short or long dividers to suit your unique arrangement!Take a look at the example photos above to get ideas of how you can take your house to the next level of organization by uncluttering every room! SET OF TWO roomy, sturdy, washable organizers 13.5″ x 9.75″ x 3.25″ – with 4 long and 8 short dividers you can use to make up to 15 cells in each box (for a total of 30 cells). COMPLETELY ADJUSTABLE: Your set comes with 2 organizers with moveable dividers. Move lengthwise and crosswise to make the size of cells that work for you. EASY TO USE! I used these in baskets that are used in our closet system. Because the baskets are deeper than the dividers, I was able to store shorter socks in the dividers and place the longer and bulkier ones under the dividers. Love it! These are great for organizing anything and everything… definitely will order more in the future!